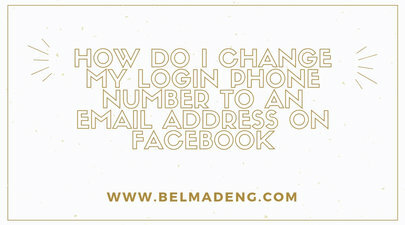 The title of this post; "how do I change my login phone number to an email address on Facebook?" was what a friend asked me on Facebook some time ago. To proffer a well-documented answer to it, I've decided to compile this post. Interestingly, Facebook has a feature that lets you access your account with either your mobile phone number or your email address. However, your email or mobile number will have linked to your account before you can use it to login. 3. Next, click Contact in the General tab. 4. Select Add another email or mobile number to add a new email to your account. 5. Select Add or Save Changes. 6. Note that you will need to re-enter your Facebook password and choose "Submit" before a new email is added to your account. You can add or remove the email addresses and phone numbers that you use to log in to your Facebook account and receive messages on Facebook. 1. Click the menu icon in the top-right corner of the Facebook website. 4. Click "Contact" to access the contact information submenu. 5. You will need to use the select buttons to choose one of your email addresses i.e if you have more than one. 6. When you have finished making changes, click "Save Changes." Bear in mind that if you make a mistake, you can click "Cancel" to undo it. 2. Next, navigate to the login section and enter your email address and password in the spaces provided. Your username name must be unique; it can only contain letters, numbers and periods; it must be at least five characters, and it can't contain Web domain extensions such as ".com." 5. Now, enter the username you want into the input box. Interestingly, Facebook will tell you if it's available or not. 6. When you find one you like that's available, select "Save Changes." To change your Facebook username, you'll also need to follow the above steps, enter your brand-new username and then click "Save Changes." 2. From the drop-down menu, click Settings. 4. Finally, click Save Changes. However, if you're logged in but have forgotten your password, you can follow the steps under Change Your Password then click Forgot your password? and follow the steps to reset it. Note that you'll need access to the email associated with your account.